Ocarina of Time’s impending manifestation in the third dimension has me extremely excited. To the very literalist meaning of the cliché, I cannot wait. Every time I hear the title screen music, whether it be from the teaser site, or the recently released 3D title screen, I just must play Ocarina of Time. I couldn’t take it; so I thought to myself, why wait? Sure, it may not be in 3D, but who cares. The original, as well as being on the 64, is on the Virtual Console, as well as on the Gamecube Collector’s Edition and The Wind Waker Limited Edition. I took out my Collector’s Edition and got stuck into it. Even though Miyamoto goes around saying Ocarina of Time looks really rough and he’s surprised people ever played it, it remains extremely playable today. Sure, it has aged – but nowhere near as much as the original Legend of Zelda, which some newer gamers place in the unplayable category. This playthrough was yet another nostalgic trip of legendary epicness, and as I sealed Ganon away for what is probably about the 50th time, it hit me that it has been exactly 10 years since I first played it. Ocarina of Time 3D is going to be a real treat, and with everything still fresh in my head, these are my final hopes and final concerns for Grezza’s 3DS remake of this classic. My number one concern by far is the possibility of change. When given the task of redesigning the best game of all time, there is very little that can be done. We all know by now that the bulk of the changes lie in the details and the nerdy tech specifications. Enhanced frame rate, smoother graphics, and overall a much more appealing and realistically detailed world, all in 3D. Background sprites such as the view of Death Mountain are now rendered in full 3D. These changes are good. Changes to storyline are bad. Changes to gameplay mechanics, other than the new control and equipment screens, are also bad. Worst of all are changes to dungeons. Any changes of this nature will be extremely hard to justify. Most of all, the worst thing that could be done is for the Water Temple to be altered. Sure, fix up the iron boot equipping issue, but nothing else, please. Don’t cave in to the criticisms and change it too much, because to me, it is one of the best dungeons ever. Aonuma may apologize for it being too hard and various other nonsense, when in fact it is fine. 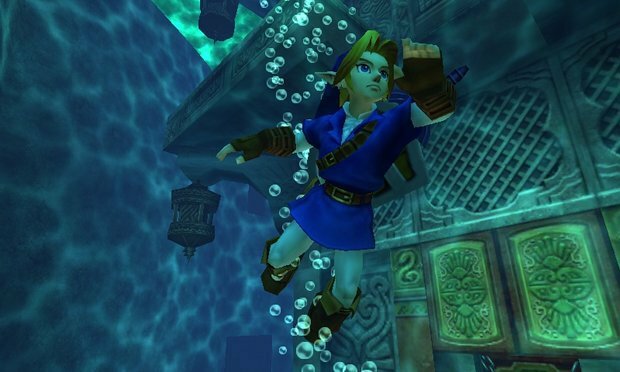 To me, alterations to The Water Temple are currently the biggest crime likely to be committed in this remake. A lesser concern of mine arises from playing Super Mario 64 DS. We don’t want Ocarina of Time to turn out like the 64 Mario classic did in this case. Yes, it is ultimately the same game, it hits you with hit after hit of nostalgia, but other than that, it is extremely not playable to me. I see Super Mario 64 DS as a good way of getting new audiences to play and love the game, but it doesn’t offer much for those who played it properly. The controls seem off, the changes to have multiple playable characters is frustrating, and the attempt at multiplayer is embarrassing. All that kept me going to the end was nostalgia, not enjoyment. 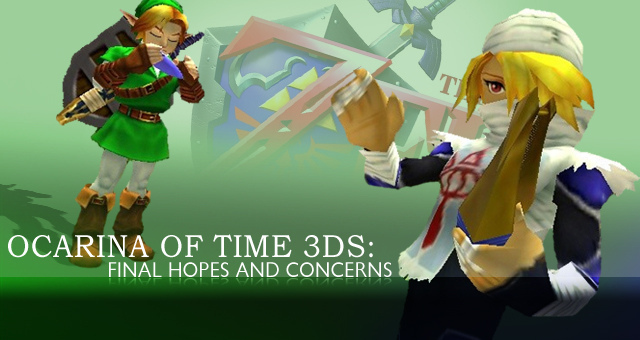 Luckily, I think Ocarina of Time 3D has been given much more attention, so the concern of a poorly ported remake is only very minor. With a third party developing it and Nintendo only pointing them in the right direction, we can expect more time and effort in the final product. I’m also hoping that this means there will be very little changes, because Grezza does not have the creative license, at least morally, to change things. Lastly on the topic of concerns is a point not of the game itself, but of the fact that it is being remade. No doubt I am excited, and if you look around, every Ocarina of Time fan will probably tell you in some way or another that their sleep is starting to be affected. Then there’s the whole new market for those who never experienced Ocarina of Time back in the 64 days – they will get to play a classic. But is that the reason for the remake? To share the goodness, or is it to make money? Is it to capitalize upon a release that is guaranteed to be a hit? Is it because Nintendo realize they will never outdo Ocarina of Time fair and square so they make a remake where they fix the criticisms of the original? Look out for an article later this week on this issue called “Ocarina of Time: Clinging to Success”. There needs to be choices in control: Although the gyroscope will be fun, the choice of traditional style aiming must be present. A saving system like Pokémon: 3DS games are to be played on the go and so a saving system exactly where you are, like in Pokémon, is essential. 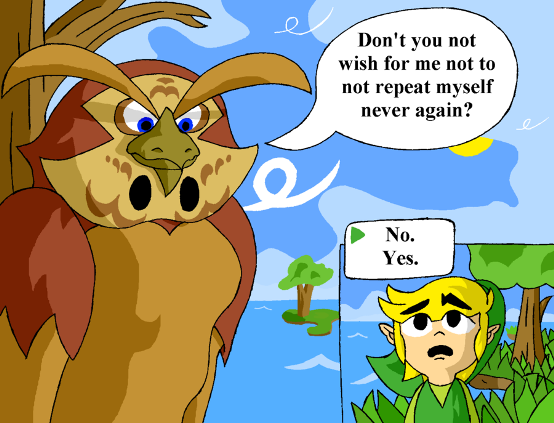 Remove those redundant questions: There is no need for Zelda to ask whether you believe her or the Great Deku Tree to ask if you’ll listen when the ultimate outcome of either answer is the same. If there is questions, there must be significant differences for each answer. Fix Navi and Kaepora Gaebora: Oh, right sorry, there’s nothing wrong with them. They’re just annoying. Ocarina controls must be special: Looking at the Flute in Spirit tracks, I would hope that to play the Ocarina we must use the touch screen and, of course, blow. Actually use the scarecrow song: The Scarecrow’s song is grossly underused (except in Master Quest) and could be implemented more. 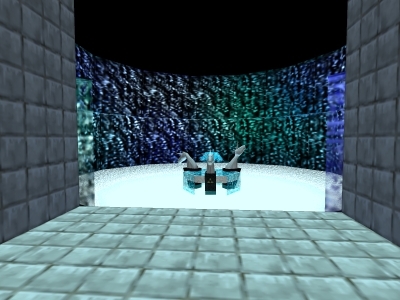 More blood: Given the rating and numerous other factors, it is more likely that the blood, especially in The Well and Shadow Temple, has been toned down. Here’s to hoping not. Meeting Sheik in the Temple of Time: It kills me inside when I warp to the Temple of Time to meet Sheik and the cutscene has Link running in through the door. Fix please. Remove Epona’s carrots: Fact: feeding horses carrots while riding does not make them go faster, however, poking them with the carrots does. A more realistic system like in Twilight Princess, although not entirely humane, would be appreciated. Enhance Epona’s IQ: A horse that comes when called is awesome. One that gets stuck behind fences when called is not however. Return of original symbols: The original crescent moon Gerudo symbol, despite its issues, is awesome and must return. Maybe the original Fire Temple music should too, despite its controversial Islamic chants and being plain freaky. Iron boots as a “C-item”: Need more be said here. Perhaps quick access to the Hover Boots too. Remove 100% completion time-travel glitch: For those of you who like to get all of the upgrades, once you’ve traveled forward in time, when you go back not all of them are available, meaning you must start again. This should go, although it does weed out those truly dedicated to perfect completions. Morpha can get you in the corners: This would make the boss fight much more challenging and have you not completely negating his (her?) attacks. Ice at Zora’s Domain melting: After the Water Temple Zora’s Domain should unfreeze to show accomplishment and the ridding of evil. Temple order should be clarified: Forest, Fire, Water and then unknown. Is it Shadow or Spirit next? The medallion and song order on the status sub screen conflict with Sheik’s comments. Although either can be done, the Hover Boots are supposed to be used in the Spirit Temple, so please indicate decisively that the Shadow Temple comes first. Harder boss in the Ice Cavern: One White Wolfos is not enough. Either make it a pack, or make him larger and stronger. Faster movement of the buttocks Mr. King Zora: Is it just me, or is this potentially the slowest, most annoying, pointless cutscene in history? It makes me want to rage my controller through the window. Simpler way to change Water Temple water levels: No, don’t ruin the temple by changing it, please! Seriously though, is there a simpler way than having to play Zelda’s Lullaby so much? A timer that counts your play time: A fairly standard feature in modern single player adventures, but not back in Ocarina of Time’s day. Controllable camera angles: Centering the camera behind Link isn’t enough anymore. We need free control like in The Wind Waker and Twilight Princess! Fix the Master Quest Water Temple glitch: Master Quest is included, so I hope this means that the glitch that sees the Water Temple to completion in two minutes is removed. Other classic glitches like Bombchu hovering and the infinite sword glitch will hopefully remain, but probably won’t. The running man must be beatable: You have teased us for far too long Nintendo, we must be able to defeat the running man. Extra surprise content: Why not have the Unicorn Fountain and that beta dungeon where Link obtains the Triforce? Because they’re unnecessary, that’s why! Have I missed anything in your opinion? What do you hope for? What are you concerned about? If you’re anywhere near as excited as I am, then having another play through of the original is likely enough to help you get by. With Master Quest also included as a second quest, there is more of a challenge for us veterans as well. For many of us, this will be our first full 3D gaming experience, because nothing so far has been worth the money. Whatever happens, this will be worth the money, guaranteed.